Coarsely chop half of the shrimp; reserve. In food processor, place remaining half of the shrimp; process to a coarse puree. Add egg, 2 tablespoons of cilantro and the garlic; process until smooth. Sprinkle mixture with bread crumbs; pulse to combine. Transfer mixture to medium bowl. Add reserved coarsely chopped shrimp, 1/2 cup of the red bell pepper and the green onions. Season with 1/2 teaspoon of the salt and 1/4 teaspoon of the black pepper; mix well. Refrigerate 15 minutes. Meanwhile, in medium bowl, mash avocado with fork; add whipping cream, mayonnaise, lime juice, remaining 2 tablespoons cilantro, remaining 1/4 teaspoon salt and remaining 1/4 teaspoon black pepper. Stir to completely blend into chunky consistency. Cover tightly; refrigerate until ready to use. Form shrimp mixture into 16 patties (about 1 1/2 inches in diameter and about 1/2 inch thick); set aside. In 12-inch nonstick skillet, heat oil over medium-high heat until hot. Working in batches, cook patties 2 to 3 minutes on each side, turning once, until patties are golden brown and shrimp pieces are pink. Drain on paper towel-lined plate. Serve warm with a spoonful of avocado mixture, and garnish with remaining 1/4 cup red bell pepper. Leftover crema can be stored in an airtight container in the refrigerator for use the next day. 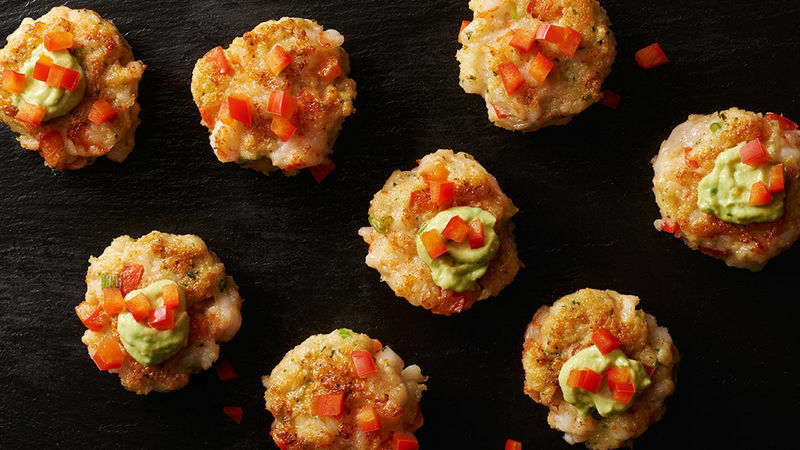 Any size shrimp that you have on hand will work in this recipe. If they are larger, just be sure to chop them.